Several bird friends overcome their reluctance to help unfamiliar animals in a colorful but lightly plotted picture book by debut author/illustrator Newton. Nate, a blue bird with a short, round beak, and his friends Tern Tern, PJ (a pelican) and Gully (who doesn’t appear to be a sea gull) decide to go fishing. But when they arrive at the beach, they discover that their usual place is covered with horseshoe crabs. 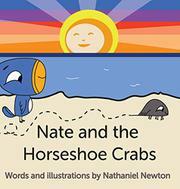 Nate offers some interesting facts about horseshoe crabs: “April through June, around the full moon, the Horseshoe crabs come out to play.” But when Nate encourages his friends to help the crabs get back to the ocean, the friends reject the idea: The crabs are too creepy looking, they protest. What if they sting? Once again, Nate offers some facts about the crabs: They don’t sting, they’ve been around since the dinosaurs, and they’re useful to humans, who don’t otherwise appear in the book. Still not convinced, the friends won’t help until Nate encourages them to imagine themselves stranded on an island somewhere. The plot ends up with no real conflict or character development, since Nate never has to take a stand against his friends’ prejudice and is able to convince them without much trouble, but the story does offer a lesson in empathy, imagining what it’s like to be in someone else’s shoes. Young readers may also pick up enough interesting tidbits about horseshoe crabs to want to investigate the fascinating creatures on their own. With character designs a bit reminiscent of Mo Willems’ Pigeon and Duckling, Newton’s charming, simplistic illustrations might encourage children to attempt their own drawn versions of the bird friends or the rocklike horseshoe crabs. Some of the words are printed in a different color for no apparent reason, and the backgrounds and word balloons are a bit amateurish. Still, young readers will flock toward the bird friends and may not mind that the simple plot is easily resolved. A facile, fairly conflict-free picture book with charming character design and enough science facts to inspire animal lovers to research further.